Erika Hinton in the field. 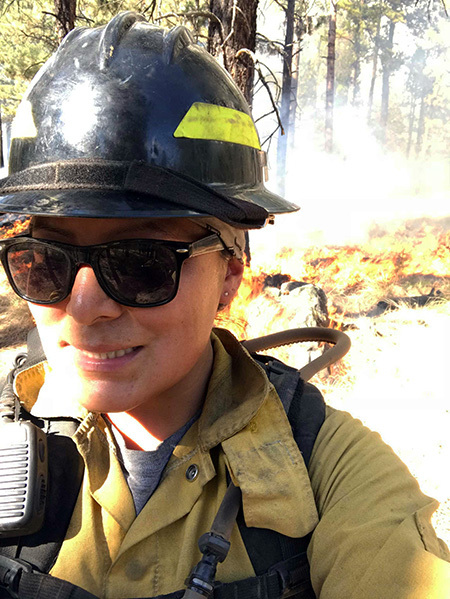 Ericka Hinton works as a fire prevention tech with the Bureau of Indian Affairs with the Fort Apache Agency Fire Management on the White Mountain Apache Indian Reservation in Whiteriver, Arizona. Before that she worked for 13 seasons with the Fort Apache Helitack crew as a lead. She became a firefighter at age 20. 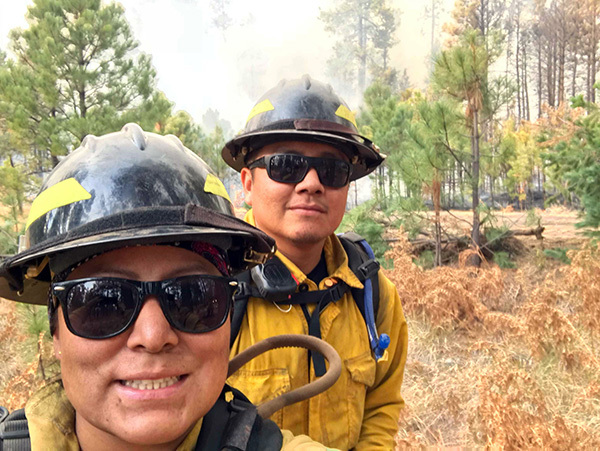 BorderLore spoke to her about her history on the job and the Apache’s traditional relationship with fire. I had my son right out of high school. I was attending cosmetology school because I thought that’s what I wanted to do. A friend of mine said, “I’m going to take my pack test why don’t you come with me?” It involves a 45-pound pack vest on a three-mile course. You have 45 minutes and 45 seconds to complete the pack test. So I gave it a try. It was all ladies that day. I remember being on the last stretch and these two ladies came and picked up my vest and we ran across the finish line with, like, barely a second left. I was the last one. I ended up going on a fire in New Mexico. It was the first time being away from my son. It was hard and I remember crying that first night. While I was away, my son’s dad was with him and my mom and my late stepdad were there to help. It was really nice to have that support, but it was also really hard. I missed out on some of the little things, ’cause you’re away for 14 days, plus travel. But I enjoyed it and that’s where I decided this is what I want to do. Ericka Hinton and her husband, Butch Gregg, have occasionally worked on the same fire crews. Now, my husband also works in fire. We both worked with the Helitack crew for 13 seasons. It was nice to have him there, but hard because we both had to be gone on assignments. My family really stepped in to help take care of our kids. It was hard, both being gone, but everything we did was for our kids. Our son is now 19 years old, our daughters are 12 and 2 years old. It’s been a while since we’ve gone out together. Now we rotate, we make sure one of us is home. Our reservation is 1.6 million acres. There are lakes and streams and people come from all over for camping and recreation. We give out information and talk to the camp hosts. This year we had our fire restrictions in place due to very dry conditions. We post signs everywhere that you can’t build fires. Some roads up in the forest were closed. I talk to the public to let them know what’s going on. I really like it when we have Head Start and kindergarten kids come by the office or when we visit schools and talk with them about Smokey Bear and how fire isn’t a toy. I also talk to a variety of kids about firefighting as a career. Sometimes people think it’s a dead-end job, but you can go far. I went through the 401 fire ecology program at Northern Arizona University. It’s a certificate. Some of us don’t have degrees, so this will help us if we choose to move up within our agency. I’m grateful that I have that. It wasn’t easy. It took two years to complete. Everything you’d learn in a semester, we do in seven weeks. Some are intimidated. I talked to some of the guys. I told them if I didn’t do it I knew I would regret it later on. So I try to encourage them. What have been some of your most difficult assignments? We have our own Fort Apache Hotshot crew. In the past they never took ladies on their assignments. But once they were short, so one of my friends, Jayne, ended up tying in with the crew. They went out to California. They needed to replace two more people and asked if I wanted to go. So myself and my husband both went. It wasn’t easy. California has some steep terrain. I remember the first day, we hiked into an area and there was no shade. We had lunch break and it was so hot. I was thinking to myself, Why did I come? But as we continued on working I also thought to myself, I can do this, I’m not going to fall out, I’m going to push myself to keep up with the guys. The whole time—the work, the hiking—I just kept saying, Keep pushing, you’re almost there. The guys were really supportive—friendly, funny, hardworking, encouraged each other. We didn’t have any problems. We worked as a team. Jayne and I were the first two women to go out on a fire assignment with the Hotshot crew. After that they started having more women. Do you have a connection to the Apache 8, the all-woman Apache firefighting crew? When I first started out, they still had the Apache 8 crew. I worked 14 days with them. Just ladies. They were out there thinning, and myself and two other ladies were piling what they were cutting. I remember thinking, Wow, it’s just ladies. They’re cutting these trees and adjusting their own saws and filing their own saws. I thought it was so neat. How cool is that? There were no men around. They were doing this work and even lifting the saws, which are heavy. I was just like, Wow. There were a couple of local fires that we went to. They were a pretty good group of ladies. They did share a lot of stories. One was about their crew boss, who was really strict, like a sergeant. That was the only time I was with them, that one assignment. After that, there hasn’t been a crew that has been just ladies. The Apache 8 became more of a mixed crew. Now it’s just the fuels crew. Me and another co-worker were talking about trying to put an all ladies crew together, even if it’s just one assignment. Hopefully we would have enough ladies. What have you’ve learned about fire and about forests from your work? Once people see fire they think it needs to be put out. The public doesn’t really understand how good some fires can be for our forest. Talking with the public at community events helps them learn of the good and bad and the differences each fire can cause to the forest. The fuels crew thin around the reservation, taking out the smaller trees so the bigger trees have more sunlight and water to grow. They’ll also do prescribed burning in the fall of thousands of acres. 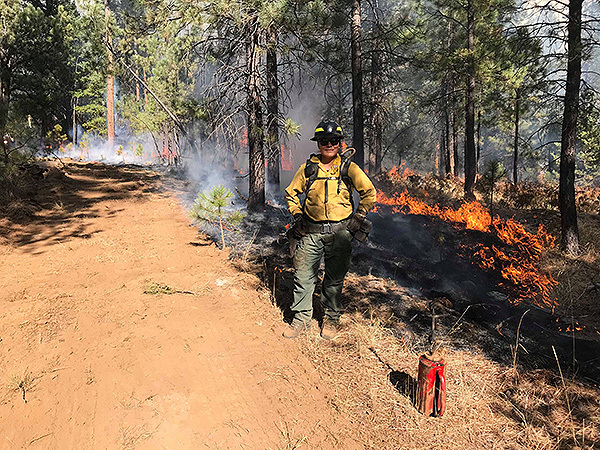 With the Rodeo-Chediski fire and the Wallow fire, the prescribed fires and thinning that the fuels crew did helped the firefighters stop these fires. When fire season comes around and there’s smoke where the public can see, we’ll get all these calls and they have to put them out. But fire is natural. It’s part of the circle of life and regrowth. It has a lot of benefits. For example, the elk come in and they like the new green grass. Fire is always different. From a half-acre fire to the big fires in California. Every time I’m out I try to take pictures. For me fire is beautiful. She’s a monster, but beautiful, I get all excited, this adrenaline rush. 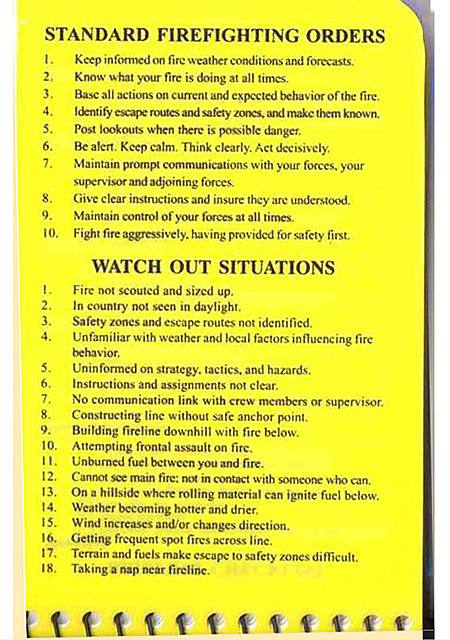 You don’t know what you’re going to do, what you’re going to see when heading out to a fire. The “10s” and “18s” are very important—those are lists of procedures we follow and things to watch out for. At the end of the day you’re happy to be back as a crew, everyone is safe. Are there any superstitions that firefighters practice? When I’ve gone out with the crew, every morning before we head out to the fire line we come together bow our heads and say a prayer. We do that every morning, no matter where we are. I think that’s really neat. What is the traditional Apache relationship with or understanding of fire? With our tradition we have a sacred ceremony, the Sunrise Dance. It lasts for four days. The Sunrise Dance is for the young lady coming of age. The godmother and father stand by her side. Blessings and Apache songs are for the girl. Once she builds her campfire, the family moves into the camp and the ceremony begins. While building a fire you say a prayer. The fire is sacred: she watches over us, she cooks our food, she gives us light at night and protects us. We do our part by feeding her with firewood. We make sure she doesn’t go out, even throughout the night we keep her lit throughout the whole ceremony. You have to make sure you feed her, take care of her because she is taking care of everyone else. Fire is also used for other ceremonies. She is sacred to us. 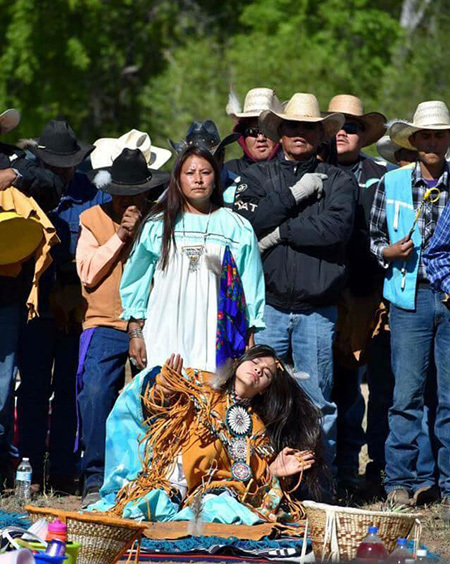 Hinton was a God mother for Jade Bonito during an Apache Sunrise Ceremony, a traditional coming of age ceremony for young girls. Some use the ashes from the fire. Say your child is having bad nightmares or there’s an ache or pain in your body, you can put a dab of ash on your head with a prayer. Sometimes I would do that for myself, if my legs are achy, or for my kids. I was also taught that you can talk to fire and it will listen. It’s like a living thing. They say if you talk to it, if you pray to it, it will listen. You can do it any time, it’s really up to you and your belief. I don’t always make it public. You don’t need to say it out loud. It’s like a prayer. It’s sacred.